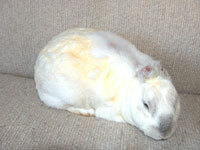 I am very saddened to let you know that Phoenix, our incredibly brave, survivor and ambassador bunny has died. He had been steadily declining, sleeping a lot and then yesterday was unable to get his legs under him to hop or move. As I shaved his backside and rear leg last night (because he had soiled himself) I wondered about his quality of life. I wondered if one of the physically strongest rabbits I had ever met---and one of the toughest survivors of animal abuse, would want to live a life in which he couldn't really move and was helpless. It is rare that I contemplate euthanasia, but because I truly love these little ones I will do what they want. I didn't need to make that decision as Phoenix quietly passed on his own last night surrounded by his friends in the Late Bloomer Club who in the past few weeks had welcomed and loved him. He was dead when I went in to check this morning. I have not posted anything yet publicly because Phoenix was such an important member of our family and I want to make sure to give him a proper tribute. I am very sad, but also knew this day was coming. He was at least 12 years old if not more. He arrived in October 2005 with a very grim prognosis. It's hard to believe that over 9 years ago on Octopber 2, 2005, Phoenix arrived critically injured at SaveABunny. As you read his story below and see the pictures it's hard to imagine what he went through. And how he was able to regain his trust in people. It was a long healing process requiring patience, hope, excellent medical care and private time for me and Phoenix. We believe that physical healing can only go so far. A rabbit must feel loved and safe. That they matter. That their life is worth living. Or, they give up. Phoenix had an incredible will to survive. He was tough. Physically he was brutishly strong. Emotionally , he didn't take crap from anyone. But, he was traumatized and would scream out when frightened. It took months for him to not scream when strangers were near or a new sound/ movement. Now in his golden years (we estimate him to be 11+ years), he is starting to slow down and sleep more. He recently had a serious bout with kidney failure and is getting regular subcutaneous fluids. We thought we'd lose him and know that that day will come at some point. Phoenix is truly an icon and a hero. 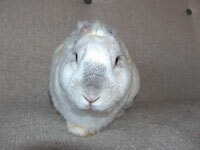 His story in the media reached worldwide and helped teach so many people about the plight of rabbits. Phoenix loves the ladies. A few years ago he lost his mate Melody and then found love again with Poodalia. They are deeply, deeply bonded and make quite the couple. Poodalia is abig,three-legged, angora fluffball who recently had to have her rear leg amputated because of a severe untreatable infection. She's also likely blind at this point,but smart and nimble. You'd never know as she bounces around quickly and often steals Phoenix's food. She's the brains of the household. He's the brawn. She tolerates his arthritic, yet amorous moves and takes very good care of him. Phoenix has been one of the most intense rescue cases I've worked on. In addition to becoming one of my favorite bunnies to snuggle he has greatly taught me about "rising out of the ashes"
We all love you Phoenix and Poodalia! Guarded optimism with Phoenix... thank you so much everyone for your thoughts, prayers and good wishes. It means a lot to all of us and me personally. Phoenix is an important part of my life and family. I know he's getting older and won't be here forever, but I wasn't quite ready for the thought of losing him Tuesday night. He's eating on his own, though I am still giving him Critical Care to help build his weight back up. He had lost 11 ounces---a lot for a bunny. He's getting Sub Q fluids, injectable Baytril,pain meds, cranial sacral work from Auntie Leni and shamanic and Reiki work from Rob and myself. Phoenix is an incredibly strong rabbit with a touching mix of vulnerability and incredible strength and will power. Though he knows he is deeply loved, we tell him even more at this time and it seems to really help. 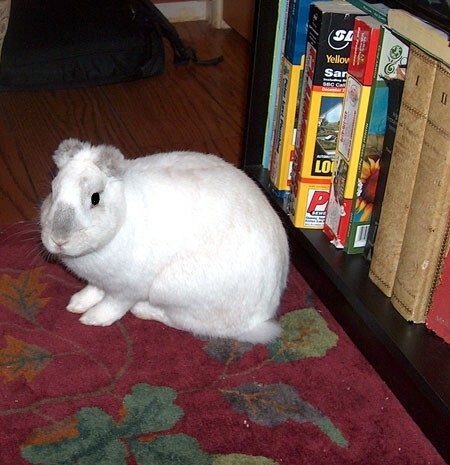 It's very upsetting to write that our miracle bunny, Phoenix, is not doing very well. Many of you may remember that Phoenix came to us in 2005 after a 16 year old boy from Vallejo soaked Phoenix in lighter fluid, burned him up and down his back with cigarettes and then set him on fire. 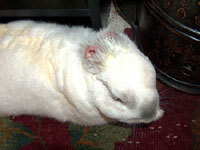 Phoenix's injuries were so severe that both his ears ultimately fell off. * Phoenix has been a true survivor! He's had two ear surgeries and for a long time was doing ok until recently, He is now struggling with a major ear infection and likely a ruptured ear drum. Last night he had neurological issues and was trembling , running a high fever and we were very upset and worried we were going to lose him! We were able to reach Dr. Debra Scheenstra who guided us in providing home emergency care for him, including injectable antibiotics, fluids, Critical Care and two pain meds. Today he is better, though a long way from out of the woods. This weekend, we will be taking Phoenix in for skull x-rays and full evaluation. Please keep Phoenix and us in your thoughts. He is very special to us. When he first arrived at SaveABunny he would scream when people approached him. I was the primary person to touch and handle him and he learned to trust again. We both had a very unique and deep healing bond. He is an incredibly brave and forgiving bunny and has even let me take him on occasion as a teaching ambassador. If you are able to help donate towards Phoenix's impending vet bills (which could be very high if he needs surgery) any amount will help. 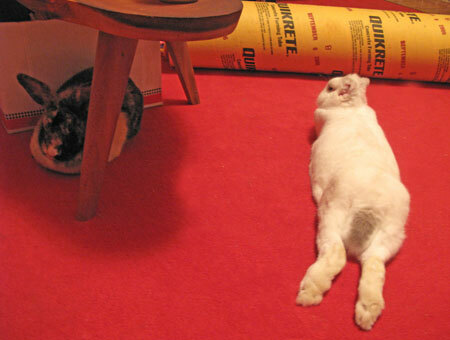 If any bun can get through this, it's Phoenix. He's a real fighter! Phoenix continues to amaze us with his resilience and ability to heal and forgive. 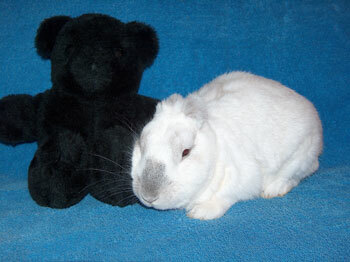 His ears are once again healed and he is greatly enjoying life at SaveABunny and his bond with mate, Poodalia. We often peek in to see them snuggled together in a warm sunbeam of light. Thank you everyone for your support and concern for Phoenix! Phoenix required major surgery on his right ear to halt a deep infection in the ear canal from his initial burn trauma and abuse. This painful, but lifesaving surgery was performed by Dr. Debra Scheenstra who performed Phoenix's initial surgery. Dr. Scheenstra opened and reconstructed Phoenix's ear and ear canal so that the infection can be reached and we are extremely grateful to her for her compassion and generous care. This brave and resilient boy is being lovingly treated and monitored with antibiotics and pain medication. If you would like to make a donation towards Phoenix's extensive medical bills, we would be very grateful (Click here to donate via PayPal). The surgery was mandatory to save his life, which we consider priceless. Your donations will help us to continue to provide only the best of care for Phoenix and other special needs rabbits who would otherwise be euthanized if we did not take them into SaveABunny. Phoenix has a beautiful, new girlfriend named Poodalia. 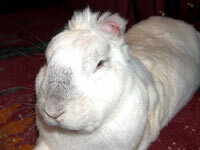 She's a snowy white, very feminine, spayed angora mix. 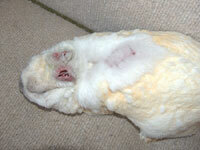 Poodalia arrived several months ago at SaveABunny as a matted mess of a neglected bunny. She got her name because we had to shave off much of her matted fur. She looked a bit like a Poodle with a bad grooming job. Despite her neglect, Poodalia was (and is) a beautiful rabbit. Though shy, her innate sweetness, gentleness and healing spirit was clear. She struck me as the perfect new mate for Phoenix, who had lost his beloved Melody. Both Phoenix and I loved Melody very deeply (photograph below) and her loss was traumatic. Like Melody, Poodalia was patient with Phoenix, who how shall we say this...just doesn't have great social skills with other rabbits. He can be a bully at first and needs a forgiving rabbit. 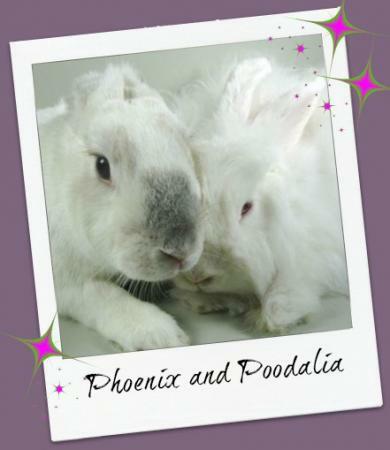 Poodalia was the perfect mix of understanding and guiding to show Phoenix how to be a good partner to her. At this point, Phoenix and Poodalia are almost always touching each other and snuggling. They are bonded and Phoenix is once again in love! We lost our beautiful Melody today. She was a graceful, beautiful girl who brought happiness to Phoenix and also to me. She had an infection which was treated with injectible Penicillin. As can happen on rare occasions, Melody had a bad reaction to the Penicillin and we lost her. She was one of the most beautiful and special rabbits I've met. Phoenix now has a girlfriend! Meet Melody, another sanctuary bunny at SaveABunny. Phoenix's story is truly one of survival against all odds and the ability of love to heal. It has been so incredibly touching and rewarding to have lived with Phoenix and witnessed him not only survive horrific torture and abuse, but also regain his trust in people. Melody is more then just Phoenix's girlfriend. She is one of the most beautiful rabbits I have ever met. She was a special needs rescue whom I met literally moments before euthanasia at a South Bay shelter. Melody had been so badly neglected and abused that she was barely able to stand on her own. As I looked into the top cage at on the left in the back room at the shelter, she had propped herself up along the side of her cage. 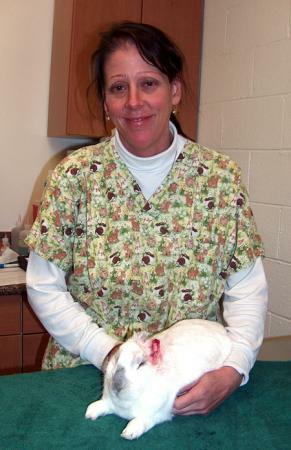 She weighed only 3.5 pounds at the time, though she is easily a 6-7 pound rabbit when healthy. She had horrible ear and fur mites. At first it looked like she had given up all hope. I spoke to her softly. I asked her if she wanted rescue and if so, I promised her that life could and would be better and that she would never be harmed again. After a few minutes she raised her head (she was so weak that she could barely lift her head)and looked at me with a look that said she was willing to give life just one more try. It took over a year for Melody to heal physically and close to two years for her to heal enough psychologically to relax when petted. When she first arrived she would cry and whimper when touched and to this day, she is most comfortable and connected with me and Rob and is afraid of most other people. She and I have a special ritual of taking naps together on the sofa while watching TV and Phoenix loves this as well. People always ask me why I try so hard to help the badly wounded and neglected bunnies when there are so many healthy ones out there (whom we also rescue). The reasons are complex. There are issues that hint at my own childhood, as well as the intensity of pure love and joy possible when helping these special animals that no one else wants. If you ever want to experience true love, gratitude and a heartfelt connection with another being, we can point you in the right direction with a special needs rescue. These amazing resilient and forgiving innocent animals deserve every chance at a happy, healthy life surrounded by love and free from abuse and suffering. 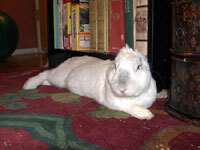 Please read about Phoenix below and watch the videos to learn more about this special rabbit. May 27, 2008 Video Update! Check out my happy feet! 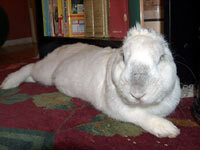 This is how Phoenix looks today He is now an ambassador bunny for SaveABunny and not available for adoption. His story will help others. On Saturday, March 2, one week after Phoenix's surgery, his ear had swollen so much that we needed to take him back to Dr. Scheenstra to have his ear reopened, cleaned and drained. It's hard to imagine what Phoenix must be feeling. His ears are raw and clearly painful, and what I think was worse for him, was the car ride. Rob (my husband and Phoenix's foster Dad) spent the afternoon taking Phoenix and Princess (formerly Priyana) to the vet, since both had medical set-backs. Princess has an abscess in her ear and you can read more about her story on Princess Priyana's page. Phoenix was subdued and a bit depressed when he returned home. As patient and as strong as he is, I can see that this is hard on him. We always reward him with a snuggle on the sofa, and some kind of treat, like a baby carrot, or very small piece of banana or apple. Phoenix is very responsive to being talked with and we find what helps him the most is for me to talk with him and reassure him while he is being handled. He seems to understand our intention to help him.He also really enjoys shoulder massages from Rob. Phoenix's medical routine right now takes about 1 1/2 hours a day and requires two people. Twice a day we give him two antibiotics, pain medicine and then flush his ear with sterile saline and a plastic needle. 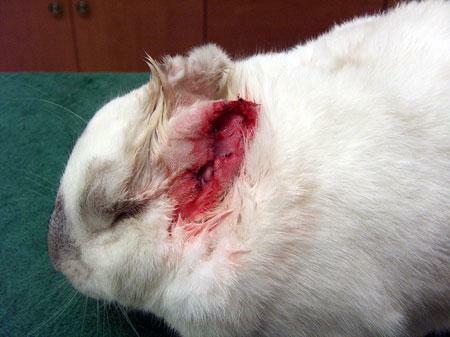 Lastly, we put drops of a Baytril and Silvadene solution in his ears for soothing and healing. Then he gets a treat. Thank you again for your compassion and support. We are deeply grateful. Phoenix required emergency ear surgery as a result of complications from his initial injury. He is now recuperating under close watch at SaveaBunny. On Saturday, February 24 Dr. Debra Scheenstra performed an extensive ear canal resection surgery, which was needed to treat a potentially life-threatening infection. We are very grateful to Dr. Scheentra for her time, compassion and generosity. 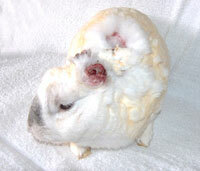 Even though Phoenix had made a miraculous recovery from his initial attack, we were advised to be guarded about his prognosis, because of medical concerns that his inner ears were vulnerable to infection, since he had lost the protection of the outer ear area, and also one ear had healed closed. Phoenix's initial injuries from being tortured, set on fire and losing his ears was so extensive that it was a miracle he survived. Even though we had been told after the initial attack that Phoenix might be at risk over time, I guess I chose not to believe it, so I was pretty devastated and worried to see him have to go through such trauma to his ears all over again. Phoenix and I have spent a lot of time together during his healing process and it is evident that we have a special bond. He trusts me and when I talk with him whether to greet him or soothe him, he connects with me at a very real and deep level. Phoenix is without question one of the bravest, most resilient rabbits I have ever met in the years I have been doing this work. It is amazing to me that Phoenix can be so happy and still want to be with people after what he has been through. One of Phoenix's favorite things to do is to run and do binkies in my office as I work. He is quite the bunny dancer! He also enjoys lying in the sunbeams and closing his eyes. It's very cute and I am so proud of him. He has learned to let me take him out to show people about animal abuse and his trust is very rewarding. So far, Phoenix has been an almost model patient. However, he is still so strong and stubborn that takes two of us to give him his medicine. And he really hates the ice packs we have to put on his ears. I can only begin to imagine what this brave and scrappy little bunny has endured in his short life. Phoenix is a real survivor and he represents and speaks for the animals that we could not save. Please keep Phoenix's recovery in your thoughts. If you would like to make a donation towards Phoenix's extensive medical bills, we would be very grateful (Click here to donate via PayPal). The $800+ surgery was mandatory to save his life, which we consider priceless. Your donations will help us to continue to provide only the best of care for Phoenix and other special needs rabbits who would otherwise be euthanized if we did not take them into SaveABunny. On June 1, 2006 Phoenix received a baby carrot, extra cilantro and parsley and lots of kisses to celebrate his eight month "anniversary" of surviving an almost fatal act of animal abuse and torture. 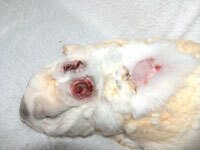 Phoenix endured second and third degree burns, and lived through having both his ears torched and fall off. His recovery has been nothing short of a miracle. On October 1, 2005, Phoenix was soaked in lighter fluid, forcibly restrained and set on fire by a teenage boy in Vallejo. Neighbors heard Phoenix screaming in pain, but he was not found by Animal Control until the next day. 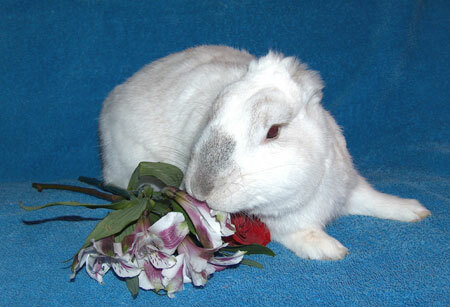 Phoenix was rushed to Benicia Humane Society and then to SaveABunny for emergency veterinary care. 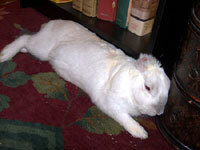 Phoenix is an amazingly resilient rabbit with a strong will to live. He is a muscular and feisty rabbit, but also sweet and tender-hearted. He loves to run and do binkies in my office while I work on the computer. As you can see, except for the loss of his ears, physically he looks great! His fur has grown back even over the deep wounds on his back that took months to heal. All the discoloration from the lighter fluid has gone away and his coat is a very soft, thick white with gray. However, the extreme trauma from his torture and abuse has left him with permanent scarring and physical and psychological issues. Physically, Phoenix's left ear has healed closed. His right ear has only a tiny opening left at the top. Basically,, Phoenix can't hear, so he becomes startled and frightened very easily. He is much jumpier and skittish than he was before his ears fell off. His eyesight is also not especially good, so he probably doesn't see as well as other rabbits. Rabbits' ears are so elemental to the navigation of their surroundings, that Phoenix seems vulnerable and a bit disoriented without them. Add in his poor eyesight and you have a bunny who is on guard a lot of the time in unfamiliar settings. When he is very frightened he can lunge, growl or bite, so we try to always talk with him when approaching and not make sudden moves. He has also become afraid of our cats and dog (sudden movements) and he will run and hide under the furniture. Phoenix must be the only rabbit. 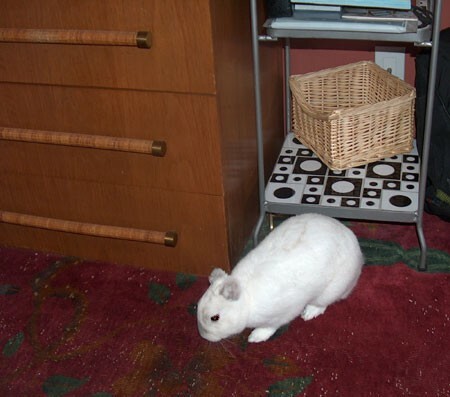 He does not like other rabbits and can be very aggressive. Adopters must love Phoenix for who he is---and not want to adopt out of pity or feel sorry for him. He HATES that! Phoenix will do best living cage-free, because he can be cage-protective with sudden movements. He will need experienced rabbit guardians who are committed to continuing Phoenix's long-term recovery. Local California adoption only, because he will not travel well. Initial home visit and subsequent follow-ups required. We were initially scheduled to testify in front of a judge in juvenile court today 2/27/06. I received a call from Courtney Andersom, the Deputy District Attorney in Solano County, who said that the defendant decided to "plead out." This means that he acknowledges wrong doing and goes on probation with counseling and the case will not be heard in juvenile court. Because the defendant is a minor,records are sealed and will likely be expunged in a year if he fulfills his probation requirements. At this point, it basically brings the legal aspect of Phoenix's case to a close. We had hoped for a felony conviction, but at least the defendant will have to receive counseling, because it is abundantly clear that he is deeply disturbed. Phoenix will stay here at our foster center either permanently, or eventually be placed up for adoption if that is something he seems to want. For right now, he is so bonded to me that he follows me and my voice, and until he can have that level of trust with someone else, he will stay here to continue on his healing journey. He is very jumpy with sudden movements and can grunt and growl when frightened. We believe that he behaves this way because of the trauma and abused he suffered. It also may be possible that he had been teased or poorly treated before his attack as well. Perhaps in time, he will be less reactive. 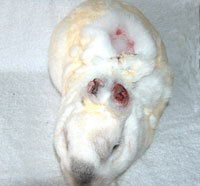 Thank you everyone for your support on behalf of this remarkable little bunny man and survivor! We are incredibly grateful to all of you. Thank you! Phoenix continues to heal both physically and emotionally. His fur is growing in over the scars on his back and is a beautiful silky white with shades of gray. He is quite a handsome boy. The yellow staining from the lighter fluid is almost all gone. I spoke with Courtney Anderson, the Deputy District Attorney for Solano County, and she is preparing the case to go before the court the week of February 28th. I have been summoned as a witness. The case is being heard in juvenile court and so proceedings are closed to the public. I will likely only be allowed in court for the time I may be asked to testify. If the date changes for the case to be heard, I will update the website. Phoenix has become very attached to me, and seeks out reassurance when he is frightened. He is startled by sudden movements and unexpected noises, and it is likely that his hearing is poor. While it is touching for me to have gained Phoenix's trust after he was so horribly abused by people,I can see the sadness in his eyes. He is much more cautious and less confident than before he lost his ears. Phoenix enjoys lots of love and special attention. One of his favorite activities (and mine!) is to nap on the sofa. 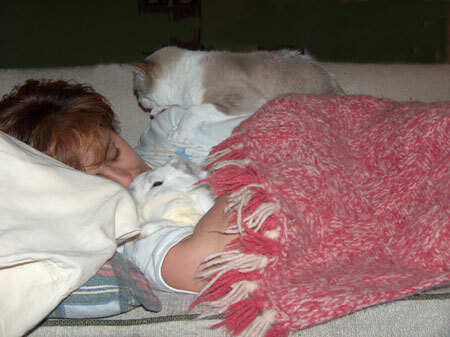 Here we are enjoying a snuggle and a snooze along with our 18 year old cat, Baby. For the most part, Phoenix is doing well. He enjoys running around my office and his binkies, hops and jumps are magnificent. He is a handsome, sturdy bunny--very muscular with a broad face and solid body. Much of the yellow staining from the lighter fluid is now off and his fur is growing back in soft, white fuzzy patches. We have observed that in the past few weeks Phoenix has become more subdued, partly due to his neutering which we appreciated more than him, no doubt. He also seems to be a bit sad. While Phoenix's physical wounds have healed he is much more sensitive to sudden movement and noises, now that his ears have fallen off. The openings to his ears have also started to close, so it is likely we will need to have them surgically reopened. Phoenix finally allows me to pet and kiss what is left of his ears and the hair has grown back in tufts around where his ears were. He and I take long naps on the sofa and he really longs to be a house rabbit. He is still not ready for adoption, so for now he will stay with us. Phoenix continues to amaze us with his resiliency and healing. He is truly very special rabbit with a strong will to live. He was finally strong enough medically to get neutered about a week ago and he is recovering very well. During the neuter surgery, while he was under anesthesia, Dr. Harvey was able to clean out the inside of his ears which had fluid and remainders of wounds from his attack. His ears and back are starting to return to normal coloration and soft, fluffy, white fur is growing back in on his back where he had large patches of burn wounds and scabs. Tufts of fur are growing in between his ears and according to one volunteer, Phoenix now reminds her of the actor, Ed Harris.! You'll have to see for your yourself. We do see the resemblance! We are very grateful to each and every one of you for your compassion and support! Thank you again for your continuing concern and support for Phoenix. Phoenix's other ear fell off over the weekend. He is trying to adapt to life without his ears. He scratches at them, shakes his head and is more sensitive and jumpy than he used to be. In time, we believe he will adjust and be the happy, brave and loving bunny that he truly is. Dr. Debra Scheenstra ,who initially treated Phoenix when he first came in, made a house call to examine Phoenix and determined that the ears and wounds on his back are healing well without infection or abscesses. However, there is some fluid in his ears that needs to be cleaned and drained, and he will soon have this done under anesthesia. I have been in regular contact with the Solano County District Attorney's office and the case has been assigned to a Deputy District Attorney (DDA). The case was originally set to be heard in juvenile court today (11/21), but has been continued as she gathers more evidence in an attempt to add a second count to the charges. Currently the juvenile is charged with one count of animal abuse, Penal Code 597, subsection B. The DDA would like to add a charge of torture, which is Penal Code 597,subsection A. In order to prove torture, she needs to prove that Phoenix's injuries were directly sustained by being lit on fire or being forcibly restrained and burned with cigarettes or some other heat source. The suspect has changed his story several times from initially saying that Phoenix lit himself on fire on the side of house where there was lighter fluid, to now saying that while he lit a bag on fire, it was Phoenix who ran through the burning bag and that's how he got burned. Two other boys were inside and were not involved and did not see anything. They only heard Phoenix screaming and saw the other boy chasing Phoenix. I did remind the DDA that there is at least a $2,500 reward in case someone did see something and wants to come forward. Since there were no eye witnesses, for the charges to hold, we need to prove that injuries of this severity would not be possible from running through a bag on fire, but rather from a localized, direct source of ignition. They may need me to testify about rabbit behavior, in which I would continue to educate about how intelligent and sensitive rabbits are, and that the suspect's account of Phoenix running into the fire is not consistent with rabbit behavior. Since the suspect is a minor, I would be inside the courtroom for my testimony, but have to wait outside during the rest of the hearing. Veterinary examination indicates that the injuries would be consistent with direct application of a heat source and not from running through a fire. The wounds on his back are localized and also looked like they were done directly with some high temperature heat source. Medical records have been sent to the DA's office and we have offered to provide expert veterinary testimony as well. I will also be sending the DDA the photos on 8 1/2 x 11 photo paper to be used for evidence and have offered to bring Phoenix and also the ear ,if needed. The first ear hat came off was intact, but the second ear was not retrievable and in small, burnt pieces. Please send polite letters of appreciation to Ms. Courtney Anderson, Deputy District Attorney for her dedication to this case and for seeking felony charges of animal abuse and torture. Phoenix will not be available for adoption for at least for several months, but if you would like to help, our Chapter and the House Rabbit Society in Richmond are in very urgent need of foster homes and adoptions, because of severe overcrowding at Bay area shelters. 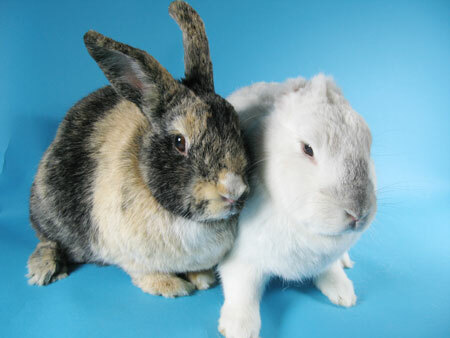 These shelter rabbits deserve the same love and attention as Phoenix, so if you can help by fostering or adopting a rabbit in need, you'll save lives. 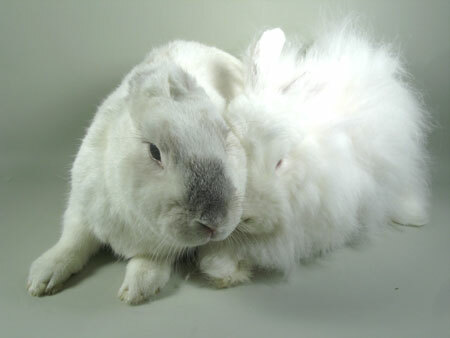 Please contact me ASAP at saveabunny@aol.com or (415) 388-2790 or Sara at HRS in Richmond at sara@rabbit.org. Thank you so much for the compassion, generosity and support you have given Phoenix and our rescue efforts. We are deeply grateful. 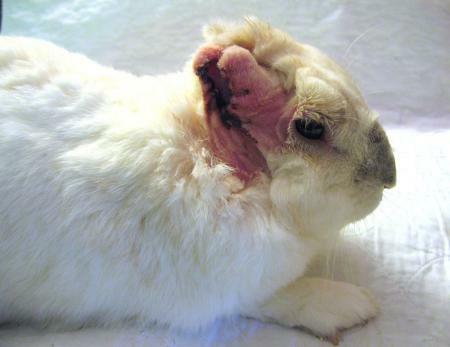 Phoenix, the Vallejo bunny who was burned and tortured, had one of his ears fall off today. While losing his ears was a very possible outcome from the severity of the injuries he sustained in the attack, the reality of seeing it happen, and tending to his needs, was quite upsetting. The other ear will fall off very soon. The suspect in this case has been arrested and is being charged with a FELONY violation--- which is what we wanted. However, since he is a juvenile, very limited information is being made available to us or the public. The case will be heard in juvenile court this month. The date is TBD and it is closed to the public. We are extremely grateful to the police and DA's office for their help and follow- through. Please send polite letters of appreciation to Mr. David W. Paulson, the District Attorney of Solano County, for taking this case very seriously and ask that they continue to do everything possible to hold the suspect accountable for this horrific crime. This individual is obviously deeply disturbed. Without intervention and appropriate punishment, next time he may kill something or someone. VALLEJO - Police have arrested a teenage boy from Vallejo whom they believe soaked a pet rabbit in lighter fluid last month and set it on fire. The rabbit survived the Oct. 1 attack but suffered second- and third-degree burns, open wounds and cigarette burns to a third of his body, police said. The rabbit, who has been renamed Phoenix, belonged to a Vallejo woman and her son. The day of the attack, the suspect had been hanging out with the son near the backyard where the rabbit was kept, police said. The teenager was arrested Wednesday and booked into juvenile hall on suspicion of animal cruelty and possession of tobacco products as a minor, Officer Dustin Joseph said. Phoenix is still recovering at a rabbit society foster care home, said Marcy Shaaf, spokeswoman for House Rabbit Society. "He is still not out of the woods medically," Shaaf said. "His ears are severely damaged, they are probably going to fall off. We don't know what the state of his inner ears is." "I am very pleased that the Police Department and the district attorney's office have taken this seriously. It's easy for people to mistake this as mischief, but this was torture," she said. Vallejo police have arrested a juvenile suspect believed to have soaked a pet rabbit in lighter fluid and set him on fire, officials announced yesterday. The rabbit, Phoenix, is recovering in Mill Valley. The arrest comes nearly a month after a Vallejo-area resident contacted police after discovering the rabbit badly burned in her neighbor's back yard. On Oct. 2, police responding to the call found the injured rabbit, which they confiscated along with cigarettes, lighter fluid and a lighter. The officers took the rabbit to the Benicia-Vallejo Humane Society, which treated its injuries and notified volunteers from the House Rabbit Society. Although the recovery process has been slow and his ears are still expected to fall off, Phoenix has regained his trust in people, society officials said. "We commend the Vallejo Police Department for taking this case seriously," said Mill Valley resident Marcy Schaaff, a director with the rabbit society. ARREST IN TORTURE OF RABBIT: Police have arrested a teenage boy from Vallejo whom they believe soaked a pet rabbit in lighter fluid last month and set it on fire. The rabbit, who has been renamed Phoenix, belonged to a Vallejo woman and her son. The day of the attack, the suspect had been hanging out with the son near the back yard where the rabbit was kept, police said. "He is still not out of the woods medically," Shaaf said. "His ears are severely damaged, they are probably going to fall off. We don't know what the state of his inner ears is. Vallejo police have arrested a suspect in connection with the burning of a New Zealand mix rabbit early earlier this month. Vallejo police were not available to comment on the arrest. Marcy Schaaf, a representative of the House Rabbit Society, said, "The police are not telling us a whole lot because he's a juvenile." She could not even say whether the suspect was in custody, but said the district attorney requested the suspect be picked up. "They've known who it was all along," Schaaf said. "This isn't confirmed, but I have heard that this possibly is not the first time that this has happened," Schaaf said. "This is obviously a deeply disturbed individual." "We're obviously hoping they will go very strong on prosecution, especially if this is not a first time offense," she said. 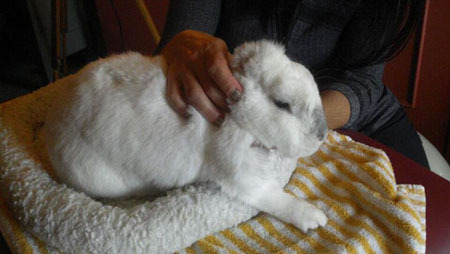 The rabbit, named Phoenix, was found, Oct. 1, by a neighbor of the owner. He was found with charred fur and cigarette burns and reportedly smelled of lighter fluid. Schaaf said he was "soaked" in the fluid. Schaaf said the animal is recovering well. "His scabs are starting to come off. It's kind of gross - sort of in big chunks, big chunks of skin and fur," she said. She said his ears are very likely to fall off. "It's sort of getting close to that point. And then, what we'll have to do after that happens is figure out if he's going to need any kind of surgical reconstruction," Schaaf said. "We don't know if the ear canals have been damaged. "Psychologically, I've been amazed that he is able to still enjoy being with people. He was pretty terrified at first but he's gotten a lot of TLC and a lot of very gentle handling and safety and a lot of love and he has been able to build up his trust again," she said. "We're hoping for the public to keep a little bit of pressure on the DA's office to keep taking this seriously because there is a direct correlation between kids who do animal abuse and grow up to be either serial killers or domestic violence (perpetrators)," Schaaf said.